In this must-have resource, long-arm-quilting expert Angela Walters and home-sewing-machine specialist Christa Watson team up to provide the ultimate guide for machine quilters. Gain insight into long-arm quilting, as well as guidance on quilting at a sit-down sewing machine. Whichever machine you use, you'll find warm encouragement and expert tips to help you every step of the way. * Learn from the masters as you discover how to stitch a wide range of quilting designs, with instructions for 10 quilts. * Find out why some designs and motifs are ideal for sit-down quilting while others are better suited to long-arm quilting. 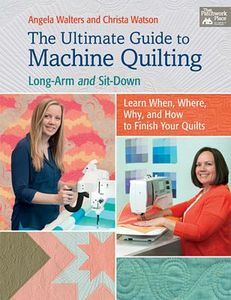 * Packed with tips, tricks, and advice on how to machine quilt better, you'll learn everything you need to know to get started confidently and finish strong. 80 pages, full color, softcover, 8.5x11in book.